That most mellow of voices (along with Frank and Bing) transfixes me. I hear it, and I'm instantly struck with holiday cheer, which for me, means shopping for foods such as cranberries, pomegranates, and, of course, chestnuts. Here's the thing with roasting chestnuts. The actual roasting and removing of the nut from its shell is a lot less romantic than it sounds. Every year growing up it was the same thing: We would enthusiastically purchase a big bag of fresh chestnuts, roast them, and then puncture our fingers in a desperate attempt to eke out the tiniest piece of chestnut we could find that wasn't studded with sharp shards of shell or tinged with mold. Thank goodness someone came up with bottled chestnuts. My mom first bought them a few years ago and sent me some. I removed the bottle top and, in 5 seconds flat, was eating a chewy, moist, chestnut devoid of shell and mold. Bottled chestnuts can be found at most organic markets and Italian specialty markets. I also like Trader Joe's vacuumed-packed chestnuts. I posted on chestnut pancakes with pancetta and creme fraiche a while back, and now it's time for a comforting bowl of soup. By February, chances are you're getting tired of cauliflower, so perhaps this recipe will re-ignite your interest. The meaty, smoky chestnuts and fresh aromatic herbs add depth to an otherwise ordinary, creamy cauliflower soup. Use bottled, dried, or -- if you're masochistic-- freshly roasted chestnuts. For a richer soup, I suggest using cream or a mixture of cream and whole milk. For fewer calories, low-fat or skim milk works well. I'm sending it to Lisa, who along with Holler, is co-hosting No Croutons Required, a new monthly vegetarian soup and salad event. This month they want vegetarian soups that would make carnivores salivate, and I think this velvety, rich, nutty soup fits the bill. In a deep pot over medium heat, saute shallots and celery in butter and olive oil, for about 3-5 minutes. Add diced potatoes, cauliflower florets, bay leaves, and water or broth. Bring to a boil, then reduce to low, and cook until potatoes and cauliflower are tender, about 15 minutes. Remove bay leaves. Add chestnuts, cinnamon, nutmeg, rosemary, and sage. Turn off heat, and let cool 5-10 minutes before pureeing. Working in batches, puree the soup in a blender until smooth and return to the pot over low heat. Add the milk and salt & pepper, and stir occasionally until the soup is thoroughly combined and heated, about 10 minutes. Just prior to serving, stir in 1 tablespoon butter to the soup for added creaminess and depth of flavor. Garnish individual bowls with fresh herbs and chopped chestnuts, if desired. i haven't tried chestnuts, shame on me. i suppose can replace them with walnuts, do you think? our evenings become quite chilly lately...*sigh* can't say goodbye to summer. My favorite chestnut experience thus far was the cans of chestnut puree street vendors would slather on gaufres/waffles, and crepes, in the south of France. However, when I tried boiling/roasting them myself this past holiday season I failed miserably. Perhaps the boiling was the error...due to your enthusiasm, I'll grit my teeth and try again. Chestnuts are absolutely lovely in soups. I made chestnut and potato soup for Christmas starters (recipe on my blog) and it was glorious and comforting. I like the way you paired it with cauliflower. I would not have thought about this combo. Great! Susan, Nat's Christmas album is one of the best and it's timeless. You soup looks divine...creamy with some bites of chestnut. Oh chestnuts are a food from my childhood! I can still remember the aroma of the piping hot, freshly roasted chestnuts in a newspaper cone. Mmm, I've always wanted to make chestnut soup, this one sounds amazing! 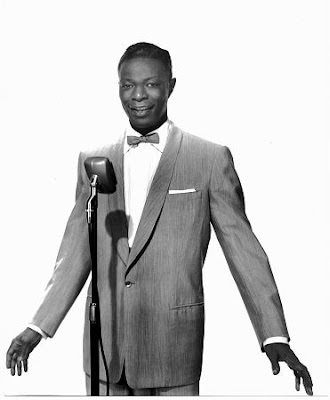 Nat King Cole was music I grew up with and it does have a very powerful attraction! Know just what you mean. And roasted chestnuts, that takes me back to Paris! Love them. And your soup with cauliflower! What a good combo! Susan - I think you would celebrate Christmas year round if you could! I'm with you on the time intensive process for preparing nuts - I have a love hate thing going with hazelnuts, and would love a "bottled version!" I'll give the soup a try since you've eliminated the difficult step! I'm with you on the difficulties of shelling any sort of nuts. The chestnuts sound devine in a soup - I have never tried nuts in a soup. I only wish chestnuts were available in Mauritius, what a pity I'm missing that! I luv cauliflower in soup. I think it is such an unpreciated vegetable that needs more time in the limelight so kudos to you!And with chestnuts, how can one go wrong! I never get tired of cauliflower. It is such a versatile vegetable. This looks like a lovely soup. I never thought of cauliflower and chestnuts together, but, why not? I have a jar stagnating in my pantry. This might be just the thing for them. Soup looks yummy, great combo. I made Apple and Arugula for her, hope she got my e mail! The first time I roasted chestnuts, I had a house full of company and I didn't pierce them to let the steam out. Well, 30 minutes later we all thought we were under fire by terrorists. The chestnuts all exploded and my oven was a disaster! I'm with you on your choice of music and food!! Yours sounds fabulous with the addition of the chestnuts. I will have to try the jarred ones. Love this entry! Thanks so much for participating in our event. the only time I roasted chestnuts, most of them exploded in the oven. I need to source out the bottled ones as you suggested. Thanks for a tummy warming recipe, Susan. I have never cooked with chestnuts - and this soup would be a delicious way to start! This looks and sounds delicious, Susan! I know just what you mean about roasting chestnuts - I learned that one the hard way this Thanksgiving when I made an herbed chestnut cranberry stuffing for the first time(http://gardenofeatingblog.blogspot.com/2007/11/herbed-chestnut-stuffing-with.html). It sounded so easy and romantic but in reality was so painful and tiresome. Next time I'm going with the prepared ones for sure! I always associate the aroma of roasting chestnuts with the street vendors in New York City. When I was a kid, chestnut and pretzel vendors were often side-by-side, and occasionally the same cart would sell both. So I guess I assicate the aroma with soft, chewy pretzels smeared with mustard, too! frankly i've never made cauliflower soup , as no one on my hubbys side likes the vegetable.But i'm sure if i made this and served it on the table, they will really enjoy it. that soup looks and sounds amazing! I've only had fresh chestnuts... once... and loved them. I'm always worried about buying the quicker versions of things at a grocery store (like peeled butternut squash, grated cabbage or carrots that type of stuff) because it always has a horrific taste to it. I will definitely look for the chestnuts at Trader Joes on my next trek. I trust your palate and if you say they are OK, then they must be. I tried chestnuts for the first time last year. I like them! They did have some mold on them, though. I made a soup with them, too! I thought I was crazy, but I guess it's more common than I think. I love the versatlity of chestnuts. This soup sounds good. I haven't ever tried chestnuts except for in William-Sonoma's glazed chestnut Panettone. Your soup looks great and I want to try to do something different with cauliflower!!! There is something about that song that can cast a spell over you in an instant. I love those old-time crooners. And the soup looks wonderful. Great for a snowy day like today here in Massachusetts. I have to buy some chestnuts on my next run to Trader Joe's! Chestnuts and cauliflower is such a wonderful combination, this soup looks so comforting! nags-They really are lovely together. arfi-Sure, walnuts would be delicious as well. meeta-I'm sure you'd like it with the cauliflower after having it with the potatoes. peter-I could listen to him forever. 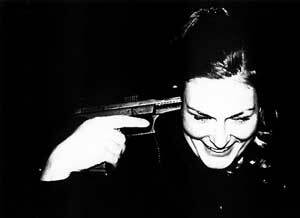 amy-I'm happy to hear it brought back happy memories for you. tanna-Oooh, you're the second person to mention chestnuts in Paris. I'd love to try them. t.w.-That's just it--it's still delicious but more low-maintenance. cakelaw-The nuts add depth and richness. veronica-Thanks! It's especially comforting at this time of year. susan-Get that jar out! It's soup time! asha-Oh, yum, apple and arugula. annie-I've so had the exploding chestnut experience. It's not funny, but it is. :) They are just so darned hard to roast, aren't they? dhanggit-I'm glad you like it. shn-Hope you find them at TJ's! aforkfulofspaghetti-Hope you get to it while it's still cold outside! mike-Or just go with the low-maintenance bottled kind. The flavor is still good. happy cook-It's one of my favorites. patricia-I hope you try them! eve-What's Thanksgiving without chestnuts (even if they are bottled)? lydia-Oh, god, I can't remember the last time I had a soft baked pretzel from a street vendor. Slathered in mustard, oh, my. kate-You might be able to sneak this one by him. melody-I'm not into the pre-cut vegetables, but the chestnuts are good. Not as good as a perfectly roasted fresh one, but then again, how do you get a perfectly roasted fresh one? glamah16-They really are versatile and are good in so many savory dishes. rosa-It is a wonderful medley of flavors. judy-WS sells bottled chestnuts too, or at least they did last year. anali-Stay warm and eat soup! nora-It really warms the belly. I have always been intimidated by chestnuts, but with these, even maybe I can give this delicious soup a try. Wow, I ve never made soup with chestnut. That must be lovely, I definitely remember this, Susan. This is a creative way to serve up cauliflower and a perfect entry for the event Susan. What I remember most about chestnuts was "horse chestnuts" which we used to play "conkers" with when we were kids. It is just a game my dad taught us from when he was a kid when there was no television, etc. zlamushka-I hope you try it. I've never made something with chestnuts, but after seeing roasted nuts on Heidi's blog, and now this, I'm dying to try!! the soup looks fab Susan! mansi-Oh, you must try them. They're fabulous! Oh! I love chestnuts in squash soup~ I never in a million years would have thought to put them with caluiflower. Most excellent~ thanks for the great recipe! temperedwoman- "Soup hussy"? That's hysterical.